For many people, renting a vehicle is a matter of convenience, whether it’s exploring a foreign country, moving house, test driving a car to get a feel of it before you buy it, or simply getting from A to B. However, car rental can also afford you the opportunity to get behind the wheel of the type of motor that’s out of reach for the majority, such as the latest supercar or a vintage vehicle from the 1930s. Although such vehicles are not typically listed as available for hire there are companies who can supply them on request. In this article we take a closer look at 10 cars that offer that extra touch of class for your special occasion, whether it’s a wedding, a graduation or simply an event where you want to make a big impression. 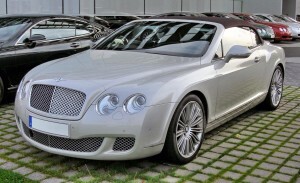 One of the most refined and elegant of British cars, the Bentley GTC Continental is a soft top tourer that offers a great driving experience alongside classic looks and elegance. It’s been available since mid 2003, and features a series of different models and configurations. The twin-turbocharged V8 outputs more than 500 bhp while managing some impressive eco-credentials, but those looking for a car to make a statement will be happy with any of the magnificent machines available. Considering the vehicle’s solidity and size, it can speed to 60 mph in a touch under 4 and a half seconds, placing it firmly in the top bracket of rapid luxury cars. With an 8 speed gearbox and electronic management, the GTC Continental offers a smooth, easy drive with some serious power at your disposal. The Bentley name often suggests a certain stuffiness belonging to an older era, but this latest offering is anything but bland or dated. It has sporty features and contemporary fittings, such as LED lights and a spoiler, while its internal fittings retain the luxury and class you’d expect from this marque. With elegant dark wood trim and classic leather interior furnishings, the Bentley is a car that offers thrills and luxury in equal measure. If you are lucky enough to get your hands on one, the McLaren MP4-12C may just be the most thrilling rental car available. Hitting the roads in 2011, more than a decade after the F1 concept car was withdrawn from production, the MP4-12C has added to McLaren’s growing legacy as manufacturer of the greatest supercars of the modern era. With a staggering top speed well in excess of 200 mph and a 0-60 time of 3.1 seconds, the power and visceral impact of this 620 bhp supercar are near impossible to beat. The two door coupe is blessed with astonishing 21st Century looks too, its carbon fibre shell styled with sleek curves and lines to give it a dynamic kerb appeal. Inside, the manufacturer has created a so-called driver zone that is space age in appearance and functionality. With an abundance of safety features and superlative road handling, the limitless power is well controlled, with great performance throughout the gears. It is built for track days and racing, of course, but to make an impact on a special occasion, the throaty roar and magnificent looks of the MP4-12C are very difficult to surpass. German automotive giant Mercedes has produced many great cars over the years, and the modern S Class is up there with the best. It’s ideal for weddings and special events, either as a fitting alternative or stylish accompaniment to the more traditional Rolls Royce or Bentley. With loads of interior space, luxury finishes and great kerb appeal, the S Class blends German efficiency with elegance and refined touches. In driving terms, the S Class is excellent. Superb suspension and handling mean that the cars are a pleasure to drive, while the range of engines offers power and precision driving. The German giant has even built a range of frugal diesels that can top 60 mpg if you’re seeking economy to go with the high levels of refinement. While the S Class won’t rival a supercar for speed or acceleration, the wonderful ride and fantastic looks more than compensate. This is a grown up car that will thrill with its drive experience every bit as much as its sportier competitors. A name synonymous with both the golden age of British motoring and the modern era, various generations of Aston Martin have turned heads as iconic cars driven by James Bond. From the 1960s DB5 to the exclusive DB10, the manufacturer has offered vehicles which scream style and cool from the movie screen to the open road. Hiring a “Bond car” will give you a terrific Aston Martin driving experience and one which is guaranteed to appeal to almost every motorist. The smallest car on this list, the Lotus Elise series 1 punches far above its weight when it comes to striking looks and incredible performance, making it a brilliant car to take out on the open road or track. The car was first released in the late 1990s and yet boasts a look perfectly suited to today’s motorist. It is extremely light, its aluminium chassis and pared down design bring the car in at a fraction over 730 kg. Unlike many of the other cars on this list, the Lotus doesn’t boast huge power, but it doesn’t need to – the S1 can hit 125 mph from a modest 1.8 litre engine and just 118 bhp. Road handling is magnificent, making this a driver’s dream; it sounds and feels vastly more powerful than its bare numbers would suggest, and offers a stunning visual to boot. It is minimalist inside and offers far fewer refinements than competing vehicles, but then very few of its rivals can offer the sheer enjoyment of the S1 out on the road. Supercars don’t come much cooler than this. The Lamborghini Gallardo Spyder offers a sumptuous performance and driving experience with a classic Italian look that will turn heads on and off the road. Simply firing up the engine reveals the delights to come, and with a top speed over 200 mph the Gallardo backs up its kerb appeal with all the power and blistering speed you could need. The V10 engine puts out over 550 bhp, and with a zero to 60 time of less than 4 seconds, the Gallardo is extremely quick off the mark. However, the superb lines and fabulous Lamborghini looks mean that this car will get everyone’s attention even at low speeds. The driving position is perfect, and you’re surrounded with stylish touches and sumptuous finishes at every turn. With an array of safety features, such as stability control, handling the Gallardo is straightforward, and the easy power gives the driver an unmissable experience. This is simply one of the finest supercars ever produced, and one that’s well worth experiencing, even for a few hours. A remnant of the classic motoring age, when gentlemen took to the roads in style. The Morgan Plus 4 is a beautiful car, with the ultimate in post-War visual appeal complemented by a great driving experience and no shortage of fun. The car was initially produced in 1950, and can top 100 mph with ease. Its four cylinder engine is not sluggish either, capable of reaching 60 mph in under 10 seconds; impressive performance in a car of its vintage. There have been various models of the Plus 4 over the years, including a version released in the early 2000s. However it’s the older models which offer the most striking appeal; two seater motoring doesn’t come much finer than this. Of course there are few of the refinements of the modern luxury car, but the timeless looks, smooth ride, and surprisingly good performance outweigh any lack of hi-tech features. The on-road experience is excellent, and the car itself makes a fantastic statement, epitomising British motoring elegance. The 997 is one of the newest versions of the classic 911 series, and has a power and style all of its own. From the blistering sub 4 second 0-60 time to the top speed above 190 mph, this modern supercar can rival the thrills of any of its competitors. With its distinctive shape and guttural sounds pouring out from the 470 bhp engine, the 997 Turbo Cabriolet is a real eye-catcher. There are few motoring thrills that offer more appeal than taking this classic sports car out for a spin and putting the foot down on a clear road. As with many cars on the list, the 911 is a car best enjoyed solo or with great company on the open road; its tight interior and low road position add to the enjoyment and make driving this superb sports car an absolute joy. Forget practicality and convenience, this is one rental car that is to be savoured for its driving experience alone. You’ll get plenty of admiring glances to boot, though mainly from drivers trailing in your wake! Another in a long line of superlative Italian sportscar manufacturers, the Ferrari name has been synonymous with driving thrills since the late 1920s. Its founder, Enzo Ferrari, passed on his dream of racing glory to establish what would become one of the world’s premier automotive powerhouses. The 458 Spider was named as Supercar of the Year in 2009, and with good reason; a top speed of 202 mph and a blisteringly quick acceleration to 60 mph in a fraction over 3 seconds give it class leading performance levels, while the brilliant steering, road handling and ride are as good as you’ll find in any motor car. Its visual impact is stunning, a tribute both to the legions of Ferrari designers and to the added input of racing legend Michael Schumacher. To fully enjoy the experience, put down the roof on the convertible 458 Spider; the top down motoring afforded by this Italian gem is hard to beat. It is guaranteed to impress on a special event or occasion, and is an equally brilliant car to enjoy alone. Of course no list of prestige rental cars would be complete without the Rolls Royce Phantom, a classic icon dating back to its first model in 1925. Perhaps the most desirable car for British weddings, the Phantom not only oozes style and sophistication but has practicality into the bargain, with acres of room inside and wide doorways making it ideal for a graceful entrance and exit. Whilst many couples and parties opt to pay extra for a chauffeur, the latest incarnation of the Phantom is also a terrific car to drive yourself, with more than 450 bhp at your disposal and a powerful 6.8 litre engine under the hood. With every possible added touch of luxury, the modern Rolls Royce Phantom is a blissful driving machine, while passengers can relax in the ultimate style and comfort that this magnificent vehicle offers. Each vehicle is hand-built and fitted and no two models are identical, thanks to bespoke features and touches which make every Phantom unique. Few cars make as dramatic an entrance or leave as big an impression as the Spirit of Ecstasy-led Phantom. 2018 AMELIA ISLAND CONCOURS: FERRARI DAYTONA! It’s been a half-century since Pininfarina created the timeless shape of the Ferrari 365 GTB/4. On March 11, 2018 that happy anniversary will be celebrated at the 23rd annual Amelia Island Concours d’Elegance with a special class of the rare and significant Ferrari 365 GTB/4 “Daytona”. It was revenge, not Ferrari that gave the 365 GTB/4 its popular nickname. The name of America’s first superspeedway clung to the big Italian GT after Ferrari prototypes avenged themselves on American soil following their stinging defeat at Le Mans in 1966. Three victorious Ferrari P4 and P3 prototypes executed a perfectly choreographed photo finish winning the 1967 Rolex 24 at Daytona, below. It mocked Ford’s botched photo finish at Le Mans the previous June. There was little subtlety in it and everyone got the point. And the name Daytona stuck to the 365 GTB/4 almost at once. Nearly 1,400 Daytonas were built in coupe and convertible configurations. It outgunned its pricier and rarer 3-liter predecessors with a muscular 4-cam 4.4-liter V-12 fed by six enormous 40-mm Weber carburetors. This exotic recipe makes 380 horsepower and propels the big two-seater to nearly 180 mph. A sobering number for a 3,600-pound GT. Engine powers Daytona #65, top. The post 2018 AMELIA ISLAND CONCOURS: FERRARI DAYTONA! appeared first on Car Guy Chronicles.